Like most of you, we really look forward to our days off. Rick, working as Ranger Rick, starts his days at 7:30 in the morning, takes a 30 minute lunch break, and then shares camp host duties with me in the evenings. Days off are Thursday and Friday, and sleeping late is a big part of the joy. Yesterday morning we were rather rudely awakened at 7:14 to be exact, by a man who had rented the group space for a family gathering, but couldn't get the lights turned on. Another park employee had locked up the box the night before, and Rick was the only one here at that hour with a key. So off he went, our good Ranger Rick, to save the day. We tried to be jolly about it, appreciating the help in getting a good early start on our day off. After lunch we were both feeling droopy, so I crawled up to the bed for a nap, leaving Rick to doze in the sun. A while later a woman who had parked her RV just above us came hollering into camp with a Very Important Question. Rick shushed her, but not before she woke me up. Grrr... What part of the "Off Duty" sigh is so darn hard to read? Still, we insisted on keeping ourselves cheerful. We whipped up some portobello burgers and purple slaw, and then escaped into town for an evening of basketball and knitting at Paddy Brannan's, Rick's favorite spot to watch a game, with nice big TVs and $3.50 Guinness. He's a Lakers fan, so he's happy this morning, but that's beside the point. We're learning that if we want to be off work, we have to get out of the park. Getting smarter as we go. We don't know the protocol for screaming babies. They aren't like drunks, who can be kicked out of the park, but they're certainly just as disruptive. Can we offer a shot of whiskey - for the parents as well as the baby? Can we suggest some tasty purple Dramamine? Can we give them directions to the hospital? Can we saunter over with a roll of duct tape? It's a real dilemma, one we'll surely come up against again. As I write this, I'm watching the Screaming Kid's dad pack up sleeping bags and take down tents. Hallelujah! They're leaving! And I think I know what to do about situations like this in the future. 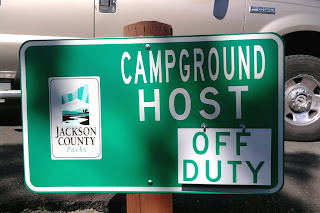 I'm going to get a big jar of ear plugs, and keep them handy for us, and other sleepy campers who come here to rest under the stars on a quiet Oregon night. Yay, you're back! Never forget you are a bright light(along with your torch)in an otherwise bleak sky - especially here in the North West where the sun ain't shining much yet. Altho the strawberries are here -yum. Can you also take down the Campground Host sign when you are off duty - well, it's a thought. Or the Off Duty sign could include: "We need our sleep to serve you better"